As you probably already suspect, since we’re making note of it here on January Magazine, Follows & concludes that the biggest chunk of screenplays over the last 20 years were adaptations of books. And however big that number is right now? It’s getting even bigger. The most common source for movie adaptations is literary fiction. 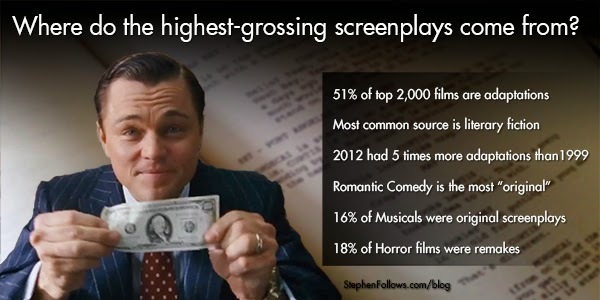 Only 16% of Musicals were original screenplays. Between 1994 and 2003, original screenplays outnumbered adaptations every year but one, whereas in the following decade (2004-2013) the opposite was true, with adaptations outnumbering original screenplays in eight of the ten years. The piece is well worth reading in-depth, and it’s here.